American industrial juggernaut MINISTRY will continue to support their critically acclaimed album AmeriKKKant with a full U.S. tour this November/December. 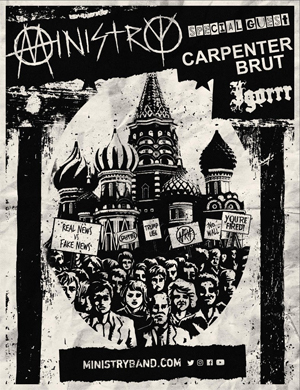 Joining them are new wave of synthwave cessations CARPENTER BRUT, and manic avant garde industrial act IGORRR. "I think the sets are going to work really well together," commented MINISTRY mastermind Al Jourgensen. "Looking forward to seeing the masses collapsing into a puddle of sweat by the end of the festivities." For decades, the powerhouse of psychotic sound that is MINISTRY has overcome millions with releases such as Filth Pig, The Mind Is A Terrible Thing To Taste, Psalm 69, From Beer To Eternity, and a flood of others. Since the 80s, founder Al Jourgensen has been combining elements of synth pop, punk, metal and even dub in a way that is instantly recognizable and has influenced many other bands. With timeless classics such as “Just One Fix”, “Thieves” and “Jesus Built My Hotrod”, MINISTRY are one of a kind musical pioneers.